More background info: Yaroslavl is a pretty old city, tracing its history back over a thousand years. From humble beginnings as a trading post on the Volga River, it was transformed into a major industrial city as early as the 18th century, when a huge textile factory was established in Yaroslavl. Culturally the place had already been of importance especially thanks to its two large monasteries. These are also amongst the main reasons why Yaroslavl is regarded as the most important place on the so-called “Golden Ring”, a string of historic cities north of Moscow that also include e.g. Vladimir, Suzdal and Kostroma. Following the October Revolution of 1917, during the Russian Civil War, rebels tried to seize control back from the newly established Bolshevik government in Yaroslavl, which resulted in a siege of the city by the Red Army and much destruction was caused. However, Yaroslavl escaped the worst of WWII (aka 'Great Patriotic War' here), thanks to its location east of Moscow (where the German assault stalled), although it was the target of some air raids due to its strategic transport hub location. But the damage caused in that way was comparatively minor. All through the Soviet times, Yaroslavl benefited from the communist regime's industrialization programmes, e.g. with the establishment of the tyre factory and a synthetic rubber plant as well as an expansion of its automobile works. By the late 1960s the city's population had reached half a million; it still hovers just above that mark today. After the collapse of the USSR, Yaroslavl, like most of Russia, suffered in economic terms, but has slowly been recovering ever since. The historic old town was put on the World Heritage List in 2005. Plenty of refurbishment of the old architectural landmarks was still under way when I visited Yaroslavl as part of my extensive Russia trip in the summer of 2017, but lots had already been finished. Not all is actually genuinely historic: the Assumption Cathedral is a recent reconstruction built from scratch (after the original had been destroyed by the Soviets in the 1930s). A particular kind of tragedy hit Yaroslavl's standing in the world of sport, namely when in September 2011 its top-league ice hockey team Lokomotiv Yaroslavl (national champions several times) was completely wiped out in a plane crash at the city's airport. Other than that there are a few smaller-scale points of dark interest within the city limits, all of them relics of the Soviet Union. First of all, there's the former House of Soviets, still bearing the typical Soviet hammer-and-sickle symbols on its frieze. It's located on – what else? – Sovietskaya Ploshchad opposite the old landmark Church of Elijah the Prophet. 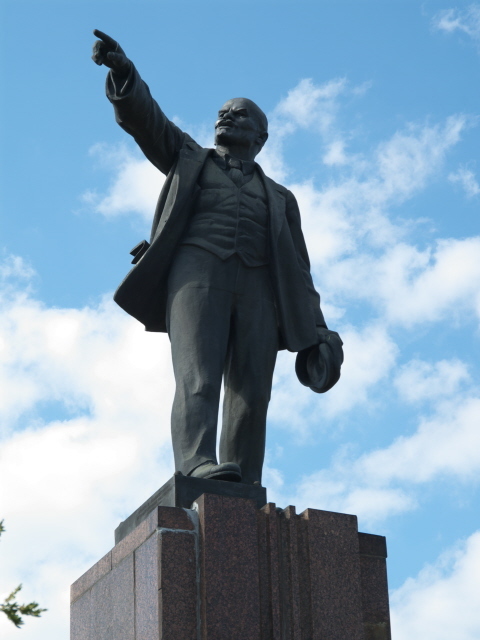 Like many cities in Russia, Yaroslavl also has its share of Lenin statues. A particularly energetic-looking one stands on a tall plinth on Yaroslavl's “Red Square”. In this case – and in contrast to Moscow's Red Square – the name is indeed a reference to 'red', not 'beautiful', as it was named after the Red Guards who defeated the Whites in the Civil War (see above). A more relaxed-looking Vladimir Ilyich is a statue of a sitting Lenin on the boulevard bearing his name, Prospekt Lenina, which forms the northern boundary of the inner city centre. Of course, like every self-respecting city, town or even village in Russia, Yaroslavl too has its obligatory Great Patriotic War (WWII) memorial (complete with an eternal flame). It's on Ploshchad Chelyuskintsev in the south-eastern corner of the city centre. Other than that there's some impressive Stalin-era architecture along the city's main boulevards, and in general Yaroslavl still looks and feels more genuinely Russian, with much less of the recent commercialization and Westernization you see these days in Moscow or St Petersburg. One thing I didn't manage to visit (and I didn't want to impose it on my Russian hosts, who had already made more than enough of an effort) was the “Museum of Military Glory” a bit north of the train station on Uglichskaya Ulitsa. This museum was set up in 1981. From what I could gather it contains various artefacts such as soldiers' personal belongings, uniforms, medals and the usual array of military hardware, partly on open-air display (including, allegedly a T-54 tank). All in all, Yaroslavl is certainly not a prime dark-tourism destination, but if you happen to be in the area or fancy a couple of days away from Moscow to witness non-capital-city Russian city life, then Yaroslavl is a very good choice for that, even though there aren't any really significant individual dark attractions here. Location: in the central part of European Russia, ca. 160 miles (260 km) north-east of Moscow. Access and costs: easy to get to by train; notably less expensive than Moscow. Details: To get to Yaroslavl it's best to take the train from Moscow – or possibly come in the other direction: Yaroslavl is a stop on the Trans-Siberian railway line, so you could get here from the east by train too, e.g. from Perm. There are at least two or three trains daily from Moscow and the journey takes between 3 and 5 hours; prices and standards of comfort vary accordingly. You can buy tickets in advance online (via various ticketing agent websites or direct from rzd.ru/). Trains from Moscow depart from the dedicated station Yaroslavskiy Vokzal, right next door to Leningradskiy, on Komsomolskaya Ploshchad. The main train station in Yaroslavl (Yaroslavl Glavny) is on the western edge of the inner city. Getting around in Yaroslavl is mostly possible on foot as long as you stay within the inner city, which is compact enough. Otherwise the city has the usual bus, trolleybus and tram network, though it might be a bit tricky to use for non-Russian-speakers. In general, Yaroslavl is far less adapted to foreign tourists than the two big cities (Moscow and St Petersburg) and fewer people speak English here. In hotels and more upscale and/or tourist-oriented restaurants, though, you can get by without Russian. I never had to find commercial accommodation in Yaroslavl (instead being hosted by locals) on both occasions I visited the place, so I can't say much about that. But I know there are a few good-standard hotels, including well-established chain hotels, like the one right by the train station. As for food & drink, you cannot expect the range of choice here that you get in the capital, but Yaroslavl too has come a long way from the days in the late 1990s when I first went there and the best you could hope for was a dodgy pizza and a bland Yarpivo lager beer. Now there's a much wider and better range of everything, though restaurants still concentrate mostly on Russian cuisine, plus a few spots serving up trendier contemporary things such as Asian (sushi) or the unavoidable burgers. The latter in particular at the few newly established craft beer places that have also arrived in Yaroslavl recently. Time required: a single day would easily do for just the few darkish attractions, but to take in the more mainstream things too you could add another day perhaps. Combinations with other dark destinations: Nothing I know of in the more immediate vicinity, so it's probably best just to head back to Moscow with its extremely rich dark-tourism portfolio – or, if you're in for a long haul, take the Transib to Perm and do a tour to the Perm-36 Gulag. See also under Russia in general. Combinations with non-dark destinations: The city's mainstream tourism revolves mostly around its many historic churches, monasteries and the remnants of Yaroslavl's own “Kremlin” (which basically means 'fortress', cf. Moscow's Kremlin). I won't go into details – there are plenty of other resources much better equipped for that, whereas to me all those churches with their onion-shaped domes look pretty much the same. The river promenade by the Volga, recently refurbished and upgraded too, is also a popular destination, if more so for locals than for foreigners, though. And the same is true for the park by the confluence of the Volga and Kotorosl rivers. These are the places people go to for “gulyating” (taking an evening stroll), a very, very Russian pastime.